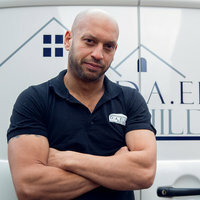 D.A.Elias Builders have been building, renovating and maintaining properties for over 25 years in and around Suffolk. Having worked with larger construction companies as well as local tradesman, we have a vast experience in many areas of the building trade. From large through to small maintenance projects, chimneys through to plastering, tiling, general alterations, and also new builds we offer a wide range of skills to assist your projects. With an all important personal touch and a friendly face we pride ourselves ensuring projects remain as clean and tidy as possible, while turning your house into the home you're looking for. The work done was changing a brick shed area into a utility/storage room. Work done to a very high standard through out . The organization of all the different trades coming in was perfect no time lost at all. Carpentry, plumbing, electrics plasterer and decorator all worked efficiently and left area tidy when they were not there and when they finished. Communication excellent I was always kept informed of what was happening. Excellent service pre, during job listened to job requirements followed through with needs. Prompt and efficient. Good job (workmanship) I have no hesitation in recommending. Danni was given my number by a damp specialist and contacted me immediately. He was polite and booked me straight away. Danni has been honest about costs and stuck to agreed budget. A very reliable hardworking man with lots of knowledge. Removed decking and relocated a raised bed, in cold muddy conditions, before preparing a green house base to specific dimension. Cheerfully done and the whole area tidied up before leaving. Care was taken to contact the green house supplier before hand to ensure everything correct. High grade brickwork repair promptly done. I had some repointing and repairs needed to a chimney stack. Danny did an estimate swiftly, confirmed a day to work and arrived promptly with a smile. The work was done to a very high standard. He tidied up and left everything in good order. I would highly recommend him for his craftsmanship and reliabilty, also very polite and friendly. Danny initially rebuilt the brick piers under my floors when my house was stripped back to the foundations. A very fast neat job that required a lot of skill levelling out the floors. He's just returned to do some external brickwork & repairs. Always with a smile, reliable & professional, I have no hesitation recommending Danny & will definitely call him again. Ian Wilson recent work completing re-build of old walled garden and construction of x large brick piers finished off with large stone pier caps. D.A.Elias Builders are first class. Reliable, trustworthy and always listens and explains clearly what they can do and more importantly, when they can do the work. I emphasise the reliability part of this review. Danny always turned up when he said he would and finished the job. Not once has he disappeared and left the job unfinished, which is sadly an experience with many tradesmen. Nothing is too much trouble and he works well with the client to complete an excellent job. Great guy, great, job! Removed old patio walls and steps. Rebuilt patio walls and steps with new bricks. Prompt hard working tidy professional worker. All done on time and within budget. Danny was a pleasure to do business with; prompt, reliable and professional. He and James worked solidly for 5 hours to plasterboard and skim a ceiling, producing a great finish and leaving everything clean and tidy. Very impressive, would recommend to anyone. Efficient. Reliable and hardworking. Took immense pride in the job, we would have no hesitation in recommending him and will certainly be using him again.